Growth Habit: Rosette forming, with flowering stems up to 30cm. The stems are branched and hairless. Many people confuse this species with dandelions (Taraxacum officionale). Cat’s ear is generally far more common than dandelion in home lawns and pastures. Type of Plant: Cat’s ear is a perennial with a deep taproot. Flowers: A bright golden daisy-like flower with many petals. The flower is located on a long slender stalk and it has a flat head. The flower stalk is branched and supports many flowers. 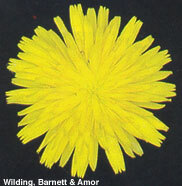 Dandelions flower stem is not branched, and supports just one flower. Fruit/Seed: A plant can produce hundreds of fine silky white seeds which germinate in autumn. Dispersal: Seeds are carried by the wind or on soil on boots and machinery. Distribution: Cat’s ear is quite widespread and can be found in pastures, roadsides, turf, gardens and wastelands. Cat’s ear is highly competitive in poor pastures. Some graziers believe cat’s ear is a beneficial component of pasture as its deep taproot is able to access nutrients from deeper in the soil than most grasses. Grubbing (all year). Remove entire plant, dispose in a plastic bag. May need to use garden tools as plant has a long taproot. Herbicide (all year). Herbicides registered in Tasmania include dicamba, MCPA, glyphosate and mecoprop.